Ambassador Rob Zaagman, with his wife Monique and sister Ingrid, came to Golden Bay/Mohua on Saturday 5 March. Following a powhiri (formal welcome) at Onetahua Marae, they spent some time getting to know more about Abel Tasman National Park with DOC staffer Neil Murray. 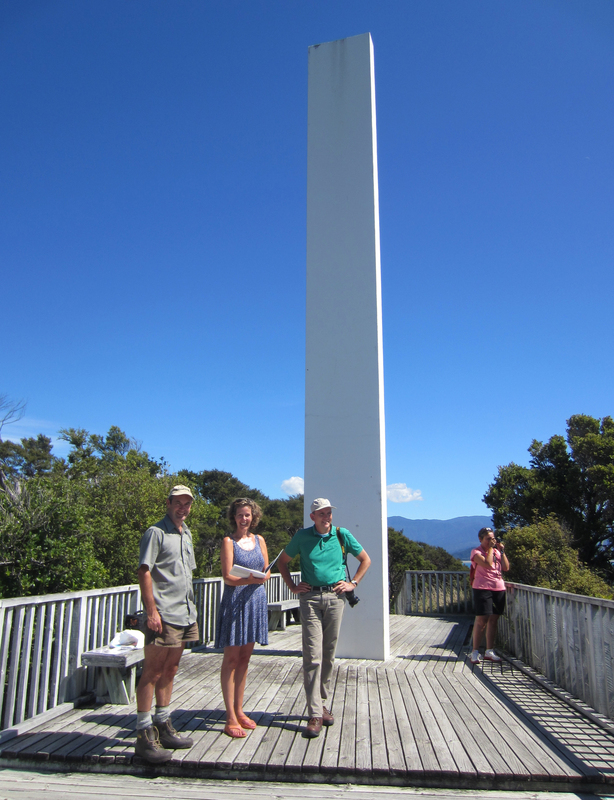 The picture shows (from left to right): Neil Murray, Monique Zaagman, Ambassador Rob Zaagman, and Ingrid Zaagman at the Abel Tasman Monument above Ligar Bay. The monument was built in 1942, as part of the 300th commemoration of the first recorded meeting (18/19 December 1642) between Maori and people of another race. Plans for the 375th anniversary in 2017 include three large information panels at the memorial, to explain the events and background. The panels are being developed by the Ministry for Culture and Heritage, which is responsible for the 20 national monuments (12 in New Zealand, 8 overseas).